It seems like an oxymoron, doesn’t it? Fun with anger managment for kids? But that’s exactly what we had went one of my twitter BFF’s and I met up (for the first time ever) in Grand Rapids, Michigan, for the Michigan Association for the Education of Young Children’s Spring Conference. Our attendees learned creative interventions for angry children which included, beach balls, playdoh, bubbles, bugs, magic wands and more! Louise provided the grand finale regarding using ASL in the classroom to help prevent behavior problems. I had a hoot watching Louise do ASL in person. I’ve seen her do it on her award-winning videos, but if you ever get a chance to see her live, don’t miss it. She doesn’t disappoint! Ohmigosh…and the prizes that the audience was treated to! Phenomenal! 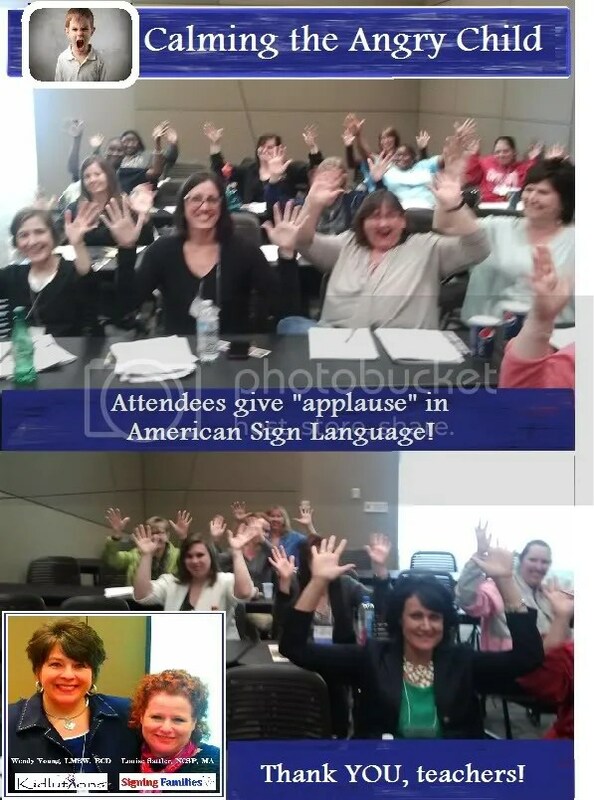 In our top picture, you’ll see our attendees give us “applause” at the end of our session. This group of educators was top-notch and it was an honor to spend the afternoon with them! They learned how they can help change brains, and improve outcomes for kids at-risk due to problems with self-regulation! Louise and me prior to our workshop! To book a speaker for topics relating to education, and almost everything else under the sun, be sure to check out411Voices.comhttp://www.411Voices.com. The speaker’s bureau covers a wide range of topics with seasoned experts on multiple topics. To get your free copy of our signature Anger Toolbox for Kidsintroduction (including an MP3, printables and more, go here! Thanks for sharing. It was a blast! I miss you already!